Do we need another book chronicling women’s experiences of the Great War? Perhaps. Are not library shelves groaning under the weight of such worthy publications? Undoubtedly. 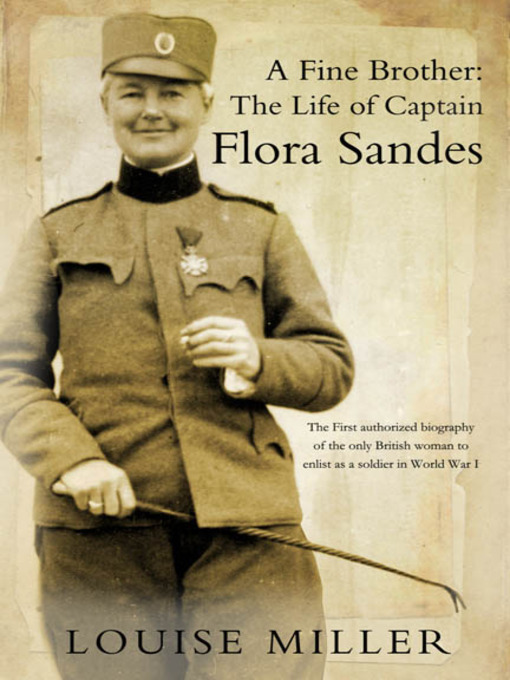 But Louise Miller’s A Fine Brother: The Life of Captain Flora Sandes gives us something new to consider: of all the 42 million soldiers mobilised during the First World War there was something different about the chubby-faced, fag-toting subject of this biography. For one thing, she was the only British woman to fight. Of course, there were plenty of women who served on the front. The Scottish Women’s Hospitals are a fine example of women’s solidarity and commitment to serve: everyone – doctors, nurses, orderlies and ambulance drivers – was female. Sneered at by the authorities (surely women would never be able to organise and undertake such work), in the event the Scottish Women’s Hospitals toiled through the unspeakable carnage of the Somme, took part in the Serbian retreat across the mountains of Albania, and experienced the Russian Revolution, saving countless lives with their tireless work. Caring for the sick and injured was something women were understood to be “naturally” good at. Women’s role was to provide a supportive adjunct to the manly activities taking place on the battlefield – their activities behind the scenes at the slaughterhouse usually involved cleaning up the mess men were making of the world and of each other. But Flora Sandes was different. Flora was on a camping holiday when war was declared in 1914. Immediately she “leaped into her French racing car” and roared back to the city. A fluent speaker of French and German (thanks to a year at finishing school), a seasoned camper, traveller, and lover of the outdoors; the game, for Flora, was afoot. Filled with self-confidence, and a certain public-school chumminess, “Jack” (Flora’s nickname for herself) was not a woman to be put aside. Like many other Edwardian ladies who found themselves unable to “go home and sit still” (words used by the War Office to leading suffragist and founder of the Scottish Women’s Hospitals Elsie Inglis in 1914), Sandes initially joined up as a member of the Voluntary Aid Detachment – a band of women briefly trained in First Aid to act as auxiliaries to the existing supply of nurses. But hospital work was not enough. Rather than brandishing thermometers and bandages, Flora Sandes preferred to handle a gun: by 1915 this grey-haired 39-year-old Englishwoman had joined the Serbian army as a private. Miller’s prose is clear, and she writes with passion about her subject, injecting a Saturday morning picture-house feel to Flora’s exploits on the Serbian front line. It is this that makes the book a bracing narrative, appealing to the general reader, though the detail supplied is, at times, rather weighty. Endnotes, and a thorough bibliography of primary and secondary sources, also give the book academic substance. But throughout the story of Flora Sandes there is a sense of isolation. It is, to an extent, the biography of someone who was concerned primarily with her own pleasures, who “all her life had done as she pleased”, though not without love and respect for the Serbians amongst whom she lived for so many years. Miller’s voice is never intrusive, though at times one is searching for analysis, for some interpretation of events that might provide more insight into What It All Means. There are moments: Miller observes that Flora was “rarely critical of the conflict”, that she relished the fighting and regarded it all as the best kind of “sport”. It is an acknowledgement which diminishes our heroine. And: “‘Be a man,’ she [Flora] was told … ‘Oh, all right,’ Flora would inevitably respond, powerless to resist such a loaded challenge.” Miller offers no critique, but one can’t help but wonder whether the world then (and now) might have been a better place if “being a man” was not a challenge worth rising to and “being a woman” something to which more men aspired. After the war, like many other women, Flora found life “dull and irksome”. She “remained nostalgic” for the conflict, and wrote her autobiography in 1927, but by this time interest in the Great War was waning and it received little attention. Life offered her other possibilities: at 51 she married a Russian sergeant 13 years her junior and passed the time babysitting a troupe of Tiller Girls in Paris who were performing at the Folies Bergère. Later still, we find Flora in South Africa, getting into trouble with the authorities for being drunk and disorderly with the local hooch makers, and driving her female relatives from their own homes with her overbearing presence. But her love affair with Serbia continued. A relic of a previous conflict, there is something poignant, but also slightly absurd, in the 65-year-old veteran “rising up and pulling on her uniform” after the bombing of Belgrade in 1941. 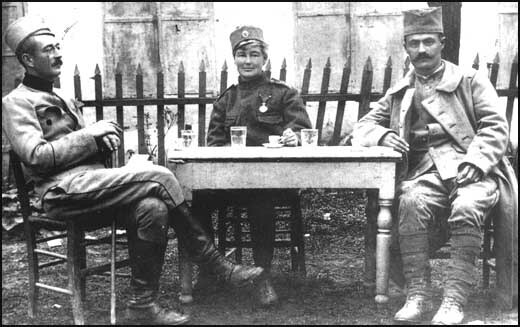 There is a strong connection between Serbia, and women’s contribution to the First World War; a contribution which is widely acknowledged in that country. Elsie Inglis served there, and Flora knew the members of Inglis’s Scottish Women’s Hospital personally, even if she was unwilling to conform to the ‘ministering angel’ role expected of women at this time. Certainly, Miller’s book raises unanswered questions about war and the role of women as fighters and killers. There is no doubt about the bravery of Flora Sandes, her hardiness and dedication to the soldiering life she chose. But perhaps we are used to more humility when it comes to interpreting the First World War, more sorrow and acknowledgement of its futility than we find here. Flora Sandes lived a life according to her own rules. The result of such uncompromising self-absorption leaves us with a fascinating account of an exceptional life. Whether you would want Flora as a house guest is another matter. Far better to meet her in the pages of Miller’s book.